For a girl who loves to eat, sleep, live fashion – an invitation for a rendezvous with India’s leading fashion designer Manish Malhotra is a dream come true! 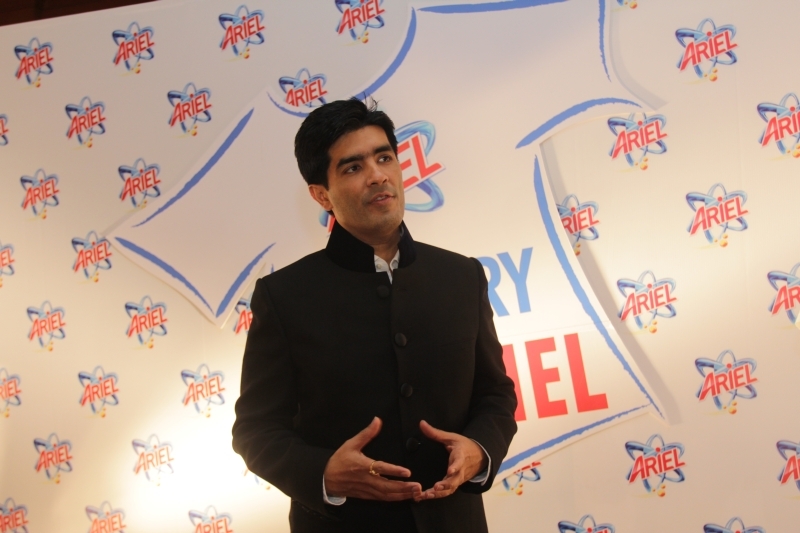 If you are wondering how Manish is associated with India’s leading detergent brand Ariel, he is the brand ambassador for Ariel Oxyblue, which he swears by to keep your clothes shining like new. And I quite agree with him. As important as it is to design, own or wear good clothes, it is important to care for them so that they keep shining like new. And Ariel is the perfect companion for garment-care. Though it can get expensive on a daily basis. When I was getting ready to meet him, I felt as if I’d forgotten what looks best on me. And that’s how conscious you can get when you are about to meet the master himself! I kept thinking to myself what a fashion designer must think about a fashion blogger! I took a deep breath and decided not to think too much and just wore the newest additions to my wardrobe ! As I entered this brilliantly lit up room at JW Marriot, I saw this handsomely dressed man , looking no less than a Bollywood star himself. Thats Manish Malhotra for you, stylish and smart. Mona Singh(from the fame of Jassi Jaisi Koi Nahi) looked stunning in a cream-colored almost gown-like ankle-length Anarkali with patchwork on net and Bronze peeptoes. She sure looks prettier and younger than what she looks on screen. 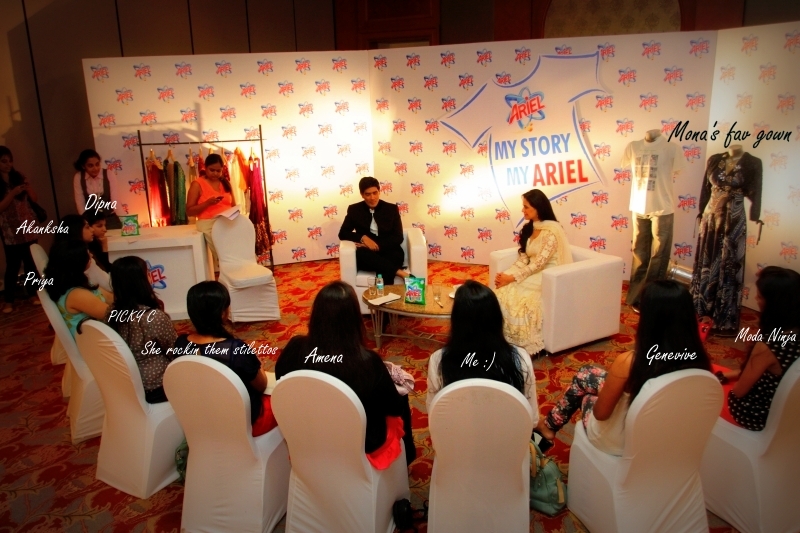 My story, My Ariel was an amazing platform to share your most treasured garment and the story behind it. · The Bandh-Gala which he wore to the event is his favorite and was designed by him 6 years ago. According to him Bandh-Galas look very classy on Indian Men. Though he designs majorly for women, this is one of his creations for men which he treasures. · A gown, which she wore to a fashion show in her final year which also won her a prize for the best dress. Surprisingly this gown was a last-minute replacement for another gown which got damaged just before the show! Manish added a pair of Fuschia Heels and a shrug stitched with matte black sequins to give this gown a 2012 appeal. · He doesn’t have any degree in design- all he knew was sketching & painting! · He is not tech-savvy . · Mona mentioned she has never seen Manish cribbing over work even when he has to shuttle between India, Paris, Milan all the time! Says he is always calm and composed! · It was his passion for Bollywood movies that drew him to designing clothes for movies. 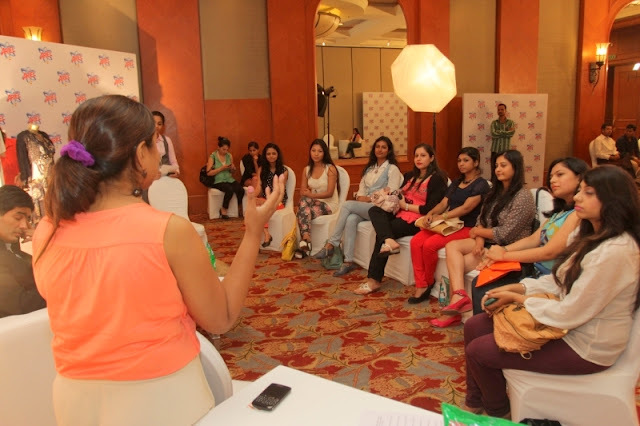 · It was owing to him that ramp fashion came into stores and became available to the common junta in India. · He believes western clothes are designed best by the locals as it is their culture. He believes in designing the traditional Indian wear and giving it the contemporary look. · Kareena Kapoor & Deepika Padukone according to him are the best dressed ladies in B-town. He feels the same for Sonam Kapoor , but thinks that instead of focusing on her mainstream that is Bollywood- the talk of the town is entirely about her dressing sense. He asked us about our favorite garments and then said- Oh these guys are too young to have a treasured garment yet! And we kept smiling ear to ear. He loved our blog names ,found them very catchy.When i told him i blog about flea markets , he promptly said- Oh ,then i am the wrong person! And then I told him how much i adore his creations, but I'm a budget shopper.Maybe some day ! sigh! I recently got orange skinny jeans as a gift from a sweet friend from Singapore. I was in a fix as it was too bright to be true! I thought who better than Manish suggest a solution for this beauty. Though I left that pair of jeans at home I described it to him. And then he went on like an idea-machine bursting with so many alternatives. He is a natural! At first he suggested a white shirt but then I told him, it still makes the outfit bright. He admitted - even white has a certain brightness to it. Then he suggested a top in greige(grey+beige) and pale brown shades that will kill the brightness of the orange. He suggested off-shoulder tops that would allow attention away from the color and warned against any other color addition! 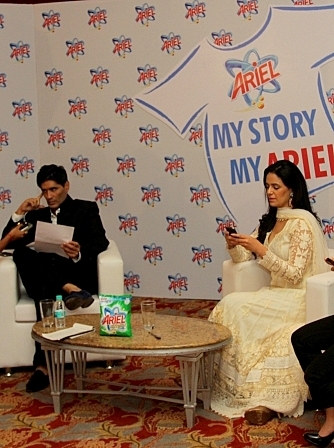 You can also share your story in My Story ,My Ariel ! Share your most treasured garment and its story on the FB page of Ariel and win exciting prizes! 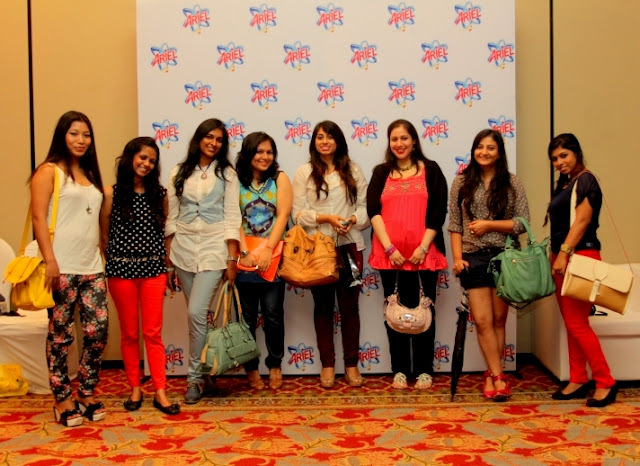 Like any other blogger-meet this one gave me a chance to meet more fellow fashion bloggers and we almost gelled like we knew each other for ages. We spoke about anything and everything but fashion. Yes, this time FOOD was the topic that took main-stage. Amena (Fashionopolis) and I love food and the food fever just got viral as we chatted over a delicious brunch. We returned guilt-ladden (thanks to the rabdi-servings) and accomplished as it was a dream come true to chat up with Manish face-to-face while he rushed in for arrangements for Delhi Couture week where he will showcase his collection on 11th August 2012. Signing off with a dream, to wear a Manish Malhotra creation atleast once in my life! sigh! 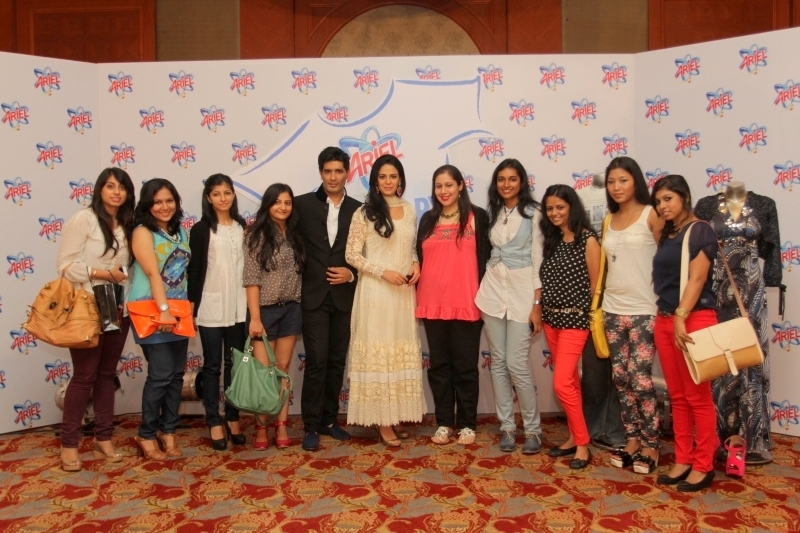 Yeah, it was great to meet the king of Indian fashion ! You are going places :-) ....and making me equally curious how are you getting connected to these events? And that is the reason we are being considered. sure it was a great experience. Wow.. Reading your post gave me a thrill! Glad you found them interesting. Hope we get to meet again ! wow,,, Manish sure is an ace Bollywood designer and I like him. I've attended some conferences where he was a speaker and found him very down to earth and intelligent!!! Wow!!! looks like you guys are having a great time!! !